On a beautiful Spring day, a team has been formed for the Big Bike Heart and Stroke Foundation who are on route through the streets in the City of Winnipeg, Manitoba, This fundraiser has a goal for 2009 to raise at least 7 million dollars. A group of women, known as the Wawanesa Wonder Women, cycle through the streets in the City of Winnipeg, Manitoba on a Big Bike raising money for the Heart and Stroke Foundation. Every April, the Heart and Stroke Foundation's Big Bike fundraiser will begin where teams are created and they cycle in the streets throughout Canada. The Big Bike fundraiser makes its way through more than 200 communities across nine Canadian provinces and raises a great deal of money for the Heart and Stroke Foundation for research and cures. This event is fun and very rewarding for the whole Big Bike team which anyone can join. A group of women on a Big Bike, Wawanesa Wonder Women - for the Heart and Stroke Foundation cycling through the City of Winnipeg, Manitoba, Canada. 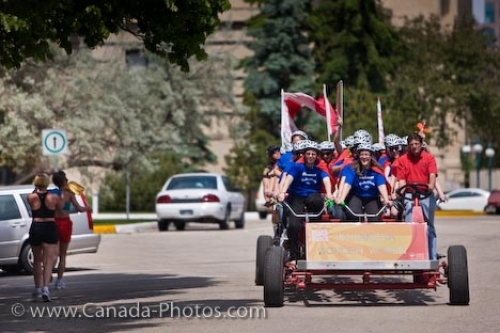 Picture of a group traveling on a Big Bike for the Heart and Stroke Foundation fundraiser through Winnipeg City, Manitoba.